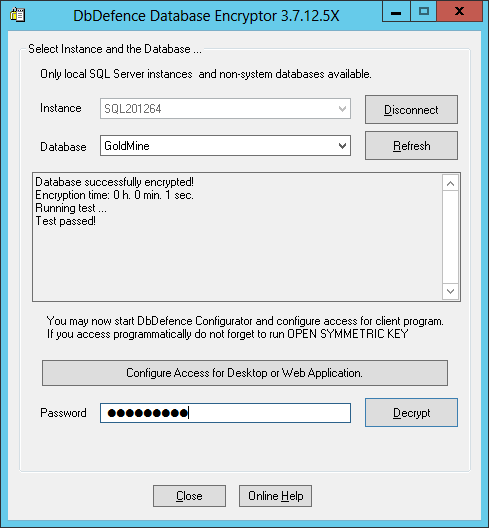 Database decryption completely removes protection and encryption from a database. You can do it for attached database and for detached database files in emergent cases. To decrypt currently attached database you need to start Encryptor, select the database and provide the password. Decryption as fast as encryption. Detached database decryption in emergent cases. Decryption can be applied to a detached database. We have implemented it in this way in order to make emergency decryption possible. For example, if DbDefence is not running on the system your database is attached to, but you need to work with the database immediately. dbencrypt.exe can be found in DbDefence installation folder. After decryption, the program renames the key file for each decrypted file. For example db.mdf.dbd_key becomes db1.mdf.dbd_key.renamed_by_decrypter. Important: Once you have started the decryption process, it cannot be stopped and it can be a time consuming operation depending on the database size. If you terminate the process, or there is an interruption to the server's functionality, it is likely that your files will be corrupted. For this reason, we highly recommend that you backup any encrypted databases before you attempt the decryption process.